Quick: Do you know what flashing is? And, no, it’s not the old guy wearing a trench coat in the park. Are they the giant block of ice that your aging ice maker makes in the freezer? They have nothing to do with the pile of dirty underwear left on the bathroom floor. Flashing, ice dams, and soil stacks are all roofing terms that homeowners may run across one day when discussing repairing or replacing an aged or damaged roof with a roofing company or contractor in the Dallas-Fort Worth area. This post begins a series called Roofing Glossary of Terms. It’s compiled to help homeowners understand common roofing terms and the materials used to construct the roofs over their heads. One: It’s a lot easier to skim reasonably shorter, linked posts on the web than it is to roll through a long, albeit thorough, compilation of words and definitions. Two: To add perspective we’ve included a What does this mean for the homeowner? tag for certain terms. That way homeowners will not only know what flashing is but why it’s important to know. Part One is for terms A-C.
Algae discoloration: A type of roof discoloration caused by algae or fungus growth. What does this mean for the homeowner? If you see discoloration, it’s best to call a Dallas or Fort Worth roofing company and have a contractor inspect your roof for damage, treatment, and possible repair. ASTM: American Society for Testing and Materials. A voluntary organization concerned with development of consensus standards, testing procedures and specifications. What does this mean for the homeowner? The ASTM name or logo on roofing materials insures that your contractor is not using cheap materials and charging you for the good stuff. It also speaks to the roofing company’s desire to provide homeowners with quality repair and service. Asphalt: A bituminous waterproofing agent applied to shinglesduring manufacturing. Very common material found on Arlington, Dallas, and Fort Worth-area residential roofs. Asphalt roofing cement: An asphalt-based cement, also known as flashing cement or mastic, used to bond roofing materials. Your Dallas or Fort Worth roofing company should use product meeting the ASTM D4586 standard. Balanced system: A ventilation system where 50 percent of the required ventilating area is provided by vents located in the upper portion of the roof with the balance provided by under-eave or soffit vents. Base flashing: That portion of the flashing attached to or resting on the deck to direct the flow of water onto the roof covering. What does this mean for the homeowner? Flashing is an area on roofs that often need inspection and repair, especially after hail, high wind, or rain storms in North Texas. More on flashing in the “F” section. Blisters: Bubbles that may appear on the surface of asphalt roofing after installation. What does this mean for the homeowner? Your roof may have been improperly installed and you will need the roofing company used to return to inspect and possibly repair their repair work, making it right. This is an example why it’s important to find a quality, honest roofer in the Dallas-Fort Worth area you can trust. Bridging: A method of re-roofing with metric-sized shingles. Caulk: Use to fill a joint with mastic or asphalt cement to help prevent leaks (not unlike caulking done elsewhere in the home. What does this mean for the homeowner? If the homeowner is comfortable accessing the roof, then caulking around pipes, stacks, and other elements is something they most certainly can do themselves. If they are unsteady working on a roof, hire a Dallas or Fort Worth roofing company to do any needed caulking repairs. A tight seal helps prevent water from entering the roof through often hard-to-find leaks. Cement: See asphalt roofing cement. It’s not the same stuff the driveway is made of. Class “A”: The highest fire-resistance rating for roofing as per ASTM E108. Indicates roofing is able to withstand severe exposure to fire originating from sources outside the building. What does this mean for the homeowner? Discuss with your Dallas or Fort Worth-area roofing company or contractor if you need the highest fire-resistance rating, or if one of the ratings below is more appropriate for your location and home. Closed cut valley: A method of valley treatment in which shingles from one side of the valley extend across the valley, while shingles from the other side are trimmed two inches from the valley centerline. The valley flashing is not exposed. What does this mean for the homeowner? 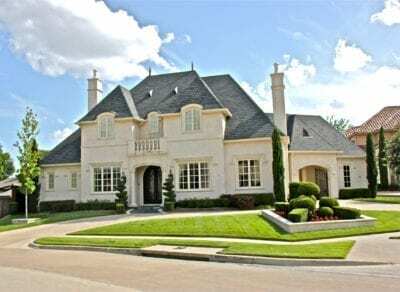 It’s an aesthetic and method of installation you may want to discuss with your Dallas or Fort Worth roofing company at the time of replacing your roof, allowing you to alter the look of your home in a different way. Collar: Pre-formed flange placed over a vent pipe to seal the roof around the vent pipe opening. Also called a vent sleeve. What does this mean for the homeowner? Make sure your roofing contractor inspects the condition of the vent sleeves as they may need replacement. Contractors often use building-grade materials when a home is built, and these will crack or shrivel over time, possibly allowing water to seep under nearby shingles or even enter the home. Counter flashing: That portion of the flashing attached to a vertical surface to help prevent water from migrating behind the base flashing. What does this mean for the homeowner? If a leak does occur, one of the first things a roofer thinks of is — flashing. If it is pulled away from the roof, after a storm for example, water can get underneath and eventually create problems. Make sure your roofing company in Dallas or Fort Worth inspects the condition of counter flashing as it may need replacement over time. Coverage: Amount of weather protection provided by the roofing material. Depends on number of layers of material between the exposed surface of the roofing and the deck (single coverage, double coverage). What does this mean for the homeowner? Make sure you get the proper amount of coverage for your home and location. If it’s too much, you (or your insurance company) will have to pay for it. If it’s not enough, roof performance may be compromised (and you may have been charged for more than you receive). This is why you want to get more than one bid from a roofing company or contractor in the Dallas-Fort Worth area. You’ll not only see bottom-line price but also strategy — how the roof is being replaced and with what materials. Cricket: A peaked saddle construction at the back of a chimney to help prevent accumulation of snow and ice and to deflect water around the chimney. What does this mean for the homeowner? Snow and ice does not seem to be much of a concern for homeowners in North Texas, but roofers in Dallas and Fort Worth note that there is enough freezing each winter to “keep an eye out for” any accumulation. Lingering snow and ice, hidden from the warming sun, can cause problems over time. Roofing terms D-H, including the Dutch Lap Method, Exposure I grade plywood and — yes! — flashing.